The Phare experience begins from the moment you approach the venue in Siem Reap. You see larger-than-life images of Phare artists on banners and billboards along the street. You are greeted by the smiling faces and warm welcome of the customer service team as you enter the site. You pause to take your first photo of the evening: the authentic red big top behind colorful lights made from recycled plastic bottles. Maybe you even looked up and noticed the nightly exodus of the fruit bats overhead from the adjacent Royal Gardens. With your ticket in hand, you pass by story panels that provide you a little background of the artists, Phare Ponleu Selpak Artistic Center where they learned their skills and the mission of our social enterprise, which is to provide them gainful employment and professional development. From there, you enter the newly redesigned Phare Boutique, where you can get some of the most extraordinary souvenirs, including original artwork from Phare visual artists. Maybe one of the hand-crafted items will catch your eye. Of course, you know you need to take home several Phare t-shirts and polo shirts as souvenirs for your friends and family. Don’t worry if you can’t make up your mind just yet. Phare Boutique will be open after the show as well. 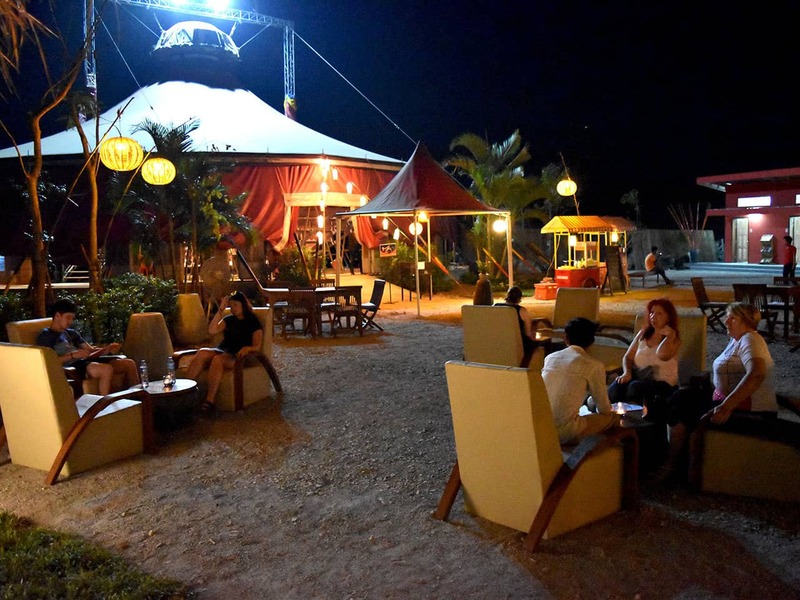 Between Phare Boutique and the big top, you discover Phare Café, serving drinks, snacks and delicious meals, from Fish Amok to Beef Kroeung. Grab a table and absorb the ambiance before the show. Another drink? Popcorn with real butter? No problem. You’re welcome to take it into the big top. Time for the main event: Phare, the Cambodian Circus. 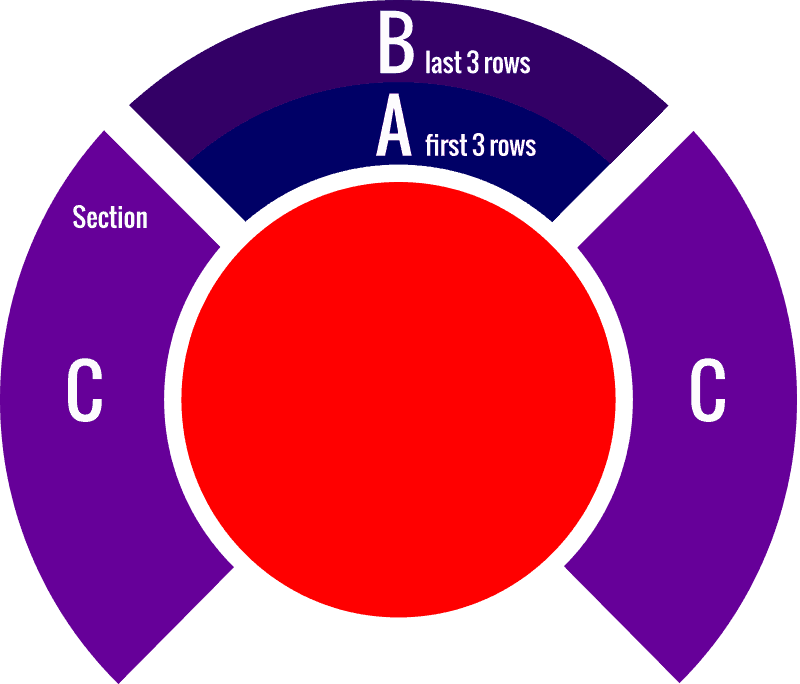 The smile automatically comes to your face as you find a seat in the traditional, authentic, circular big top. Maybe you’re thinking of a circus you went during your childhood, but guaranteed, this will be unique. The music, acting, acrobatics and high-energy music will captivate you. At the end, the artists welcome you on stage for a chat or group photos. Don’t be shy: they certainly aren’t. You exit the big top feeling exhilarated. When you pass back through Phare Boutique on the way out, you know exactly which souvenirs you will take home. With your bag in hand, you jump in one of the tuk tuks waiting for you. Do you go to Pub Street or back to your hotel to look at all the pictures you took and upload them to your social media? Visitors can take home a piece of the show while also changing lives. Money from every piece of artwork bought goes straight back to the artist, allowing them to keep themselves and their families out of poverty. 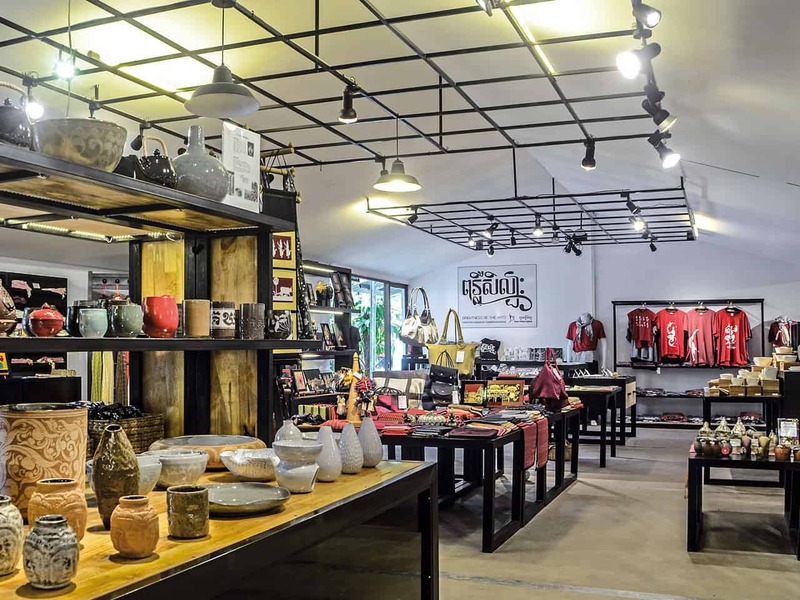 Most products sold at the boutique have been produced by Phare students, or made by Cambodian locals. Recent additions to Phare Boutique include original music CDs from the show “Sokha”, DVD of the documentary “Angkor’s Children” and unique new Phare t-shirt and polo shirt designs. 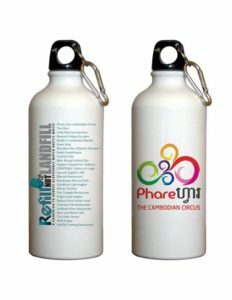 Phare is also a member of the RefillNotLandfill – Cambodia group, with refillable water bottles to help reduce plastic waste and protect the environment. Even if you don’t have time to catch the show – make sure you stop by and take some time to feast your eyes on these exquisite creations while also supporting these local artists. Today, our 1300 employees are proud to show that Cambodian handicraft is still alive and more creative than ever. 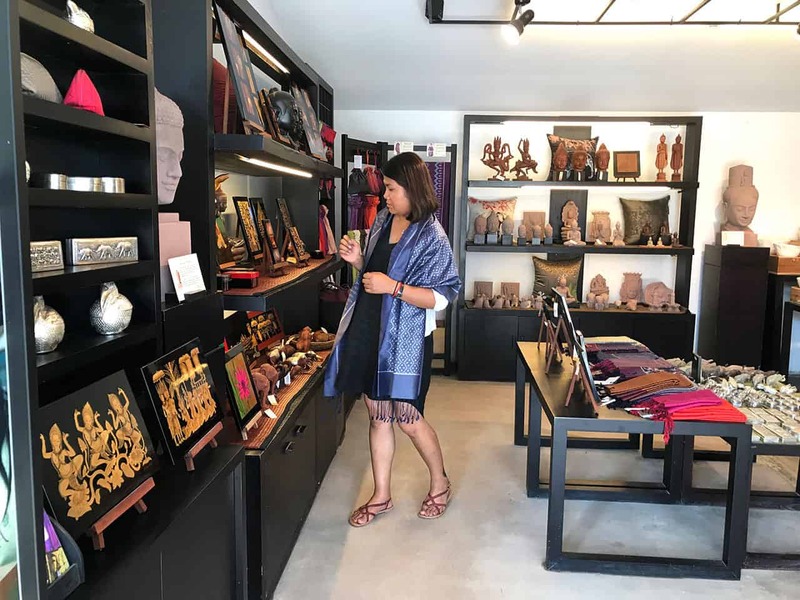 By developing high quality products that express the dynamism of the Khmer culture, Artisans Angkor strives to be a timeless showcase for Cambodian crafts with pieces inspired by Angkor heritage as well as fashionable handmade clothing and decorative items that can suit contemporary. A Cambodian Women’s Non-Governmental Organisation that empowers vulnerable women to improve their political, economic and psycho-social situation through implementation of community development projects, advocacy work and encouraging men’s participation in addressing issues affecting women. In October 2012, an Australian living in Siem Reap was introduced to the team through her best friend who volunteered there, and seeing how motivated the Khmer volunteers were, started working as Operations Manager with the goal to initiate new projects, support the team with new skills and ensure a sustainable future for the organisation. In October 2014 we built our own school and moved 4km further into a more rural commune. We now focus on education, vocational training and community support. We provide English, Living Values, Preschool, Khmer, Art, Library and Movie Club. We teach a four month Sewing Program to students classified as Poor Level One, Two and Three and have a home sewing business. 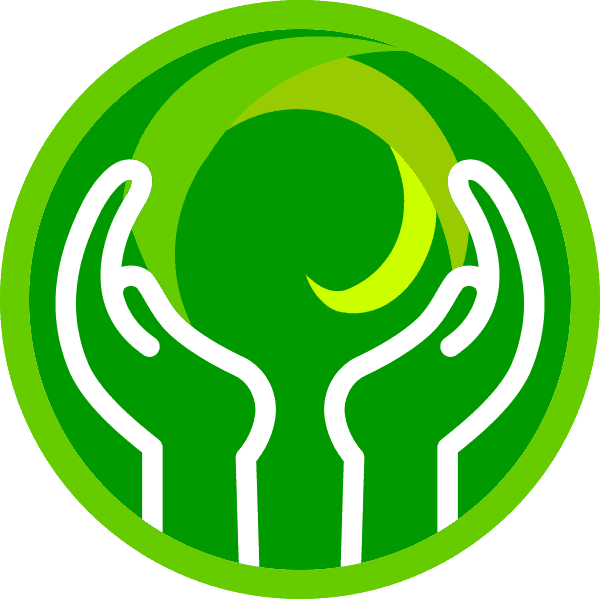 We assist the community with our Microfinance Program, Family Farm Program and community outreach. We provide University Scholarships and Further Education Scholarships to our staff, and run weekly capacity building workshops for them. New Hope Cambodia is a grass roots, rapidly growing Non-Government Organisation (NGO) run by a dedicated individual, a local Khmer named Sot Suo (Kemsour). The focus of New Hope is ‘free education for all’ as the founder’s recognition of the vital role education plays in helping break the cycle of poverty. However the organisation cannot ignore the chronic malnutrition, ill health and horrific living conditions of its community.This environment places families at high risk of falling victim to child traffickers. For this reason, New Hope Cambodia’s activities and programs address the daily issues facing families in crisis situations and, at the same time, find ways to work toward a better future. Rice is the main staple food in Cambodia, but is also the base of the distillation of alcohol hence the preparation of rice wine. Throughout history, the Khmer have used local liquor in traditional medicine to extract the benefits of fruits, spices and roots. The spices and local fruits freshly bought from the market are infused in the spirit. The flavours are always presented in a combination of 2 to enhance the balance and complexity in taste for this Cambodian liqueur. A sugar cane stick is inserted in each bottle rounding out the taste, giving it an additional woody flavour as time goes by; already very tasty at the time the beverage is bottled, it all gets even better with time. Some may say “no matter the bottle, provided there is tipsiness”. To agree to this implies ignoring the quality of young Cambodian artists and their ability to sublimate the bottles. And “to crown” the whole thing, each Sombai bottle proudly bears its traditional colourful krama cloth over the bottle top. Sombai bottles are painted and decorated by hand, making each of them a unique piece and an amazing souvenir. 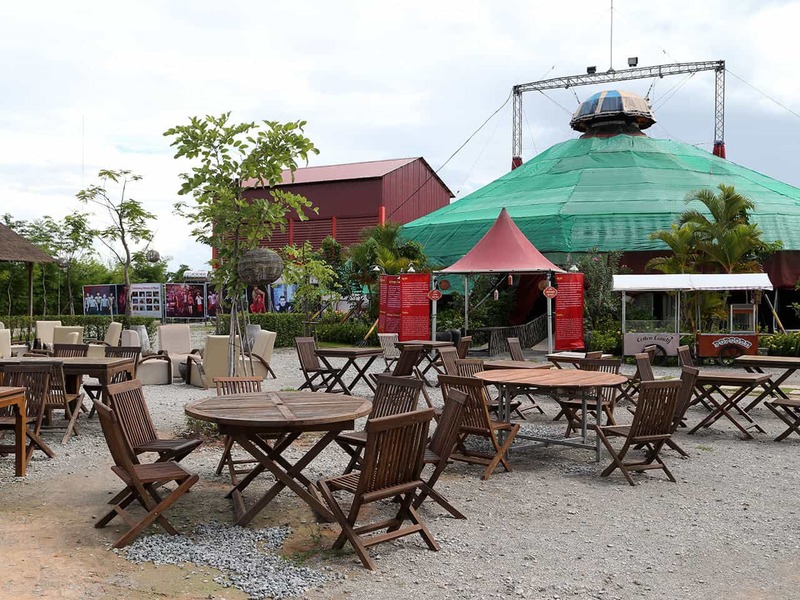 After passing through Phare Boutique, browsing the unique gifts and authentic paintings and drawings, you emerge into the open-air seating of Phare Café, where you can continue your Phare experience with a cold drink, light snack or a complete dinner from Fish Amok to Beef Kroeung. As the sun sets and the the colorful lights come on, a unique ambiance is created that can only be experienced at Phare. There’s something special about dining next to the authentic, red big top. In addition to a la carte dining, delicious 3 course set menus are available (advance reservation required) for dining before or after the show. Looking for a performance of a different kind for your event?